Since 1982, interior designer Ellen Kennon has been creating environments often described as magical and healing. In addition to running her own design firm, Ellen was head of interiors for Peter Marino Architect’s Manhattan office whose clients included Valentino, Yves St. Laurent and Calvin Klein. 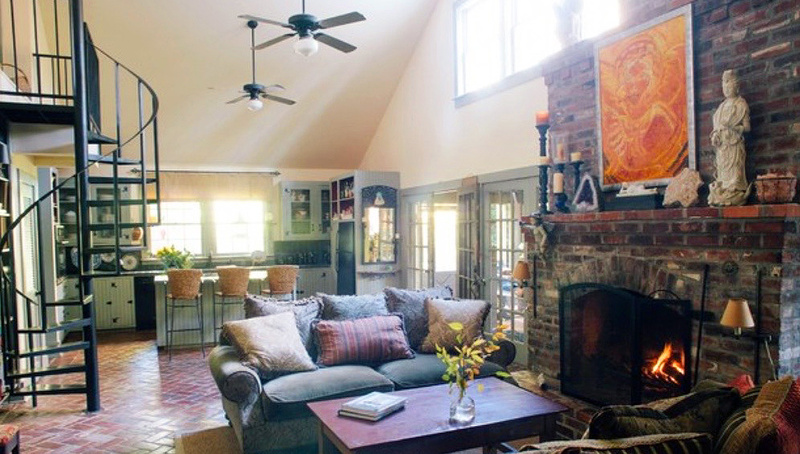 Ellen has decorated numerous residences and offices in New York and the Gulf South and also created the architectural design for several country retreats including Harmony House, debuted as a decorator showcase house in Saint Francisville. Ellen’s holistic approach to creating interiors is featured in House Beautiful The Home Book: Creating a Beautiful Home of Your Own. In 2001 Ellen created her line of Full Spectrum Paints and although she has never advertised, they have been featured in numerous national publications including Architectural Digest Magazine, The Wall Street Journal, The New York Times, Southern Accents Magazine, New York Magazine, Dwell Magazine, Interior Design Magazine, Renovation Style, Home Living Connecticut, Palm Beach Cottage & Gardens and House Beautiful Magazine and House Beautiful books Colors for Your Home, Style 101: 400 Designer Secrets to a Beautiful Home and 500+ Favorite Paint Colors. House Beautiful’s articles have featured Ellen as one of “twelve major players in design” and “three of the best color consultants”. Ellen created a custom color palette for renowned artist Hunt Slonem‘s exhibit at the Ogden Musuem in New Orleans that was featured on CBS Sunday Morning and is also featured in Slonem’s books, When Art Meets Design and Pleasure Palaces: The Art & Homes of Hunt Slonem . Her philosophy on color therapy is quoted in James Morgan’s critically acclaimed book Chasing Matisse. In addition to paint, Ellen offers a collection of custom furniture for home and garden. She won an Alpha Award in New Orleans for furniture design and designed a collection of iron and limestone furniture which was featured in Architectural Digest Magazine. Chasing Matisse, a novel by James Morgan, pages 140-141 (quoted philosophy on color therapy). ColorFlow: Discover Your Perfect Colors Experience Life’s Easy Flow, by Patricia Kay Lebow, page 193. Choosing Easy World, by Julia Rogers Hamrick, pages 177 & 236. Feng Shui Fun, by Trisha Keel, PhD, “Enhancing Your Wisdom and Small Earth Energy”, page 88. Simply Color for Everyday Living, by Diantha Harris. April 13, 2008: CBS Sunday Morning, segment on Hunt Slonem which showcases the colors we created especially for his Ogden Museum Exhibit in New Orleans.